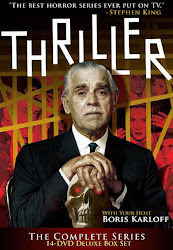 ATAD readers will definitely want to pop over to Mulholland Books, where our own David J. Schow weighs in with a nice overview of Thriller: "Thrilling Crime." As always, thoroughly enjoyable and informative stuff from DJS. Nothing new there, of course, for any of you who are such an intimate of this blog that you go as deep as reading these comments ... but important to note that our side-swipe into the crime genre helped us get noted as the day's feature piece on the website of the hottest new crime fiction imprint to come along since Hard Case Crime. And thanks to Larry R for pointing out that "Waxworks" is, in fact, supernatural -- the same way that "Yours Truly, Jack the Ripper" was a crime/suspense episode for 90% of its running time, then tipped over at the very end. In fact, the pattern is the reverse of many other THRILLERs, which pretended to the supernatural, then revealed themselves as crime shows in the last act.